We were hugely impressed when we first tested this new Rega in HFC 279, and its first Ultimate Group Test outing has not diminished our admiration. At the price, this is an exceptionally musical CD player. 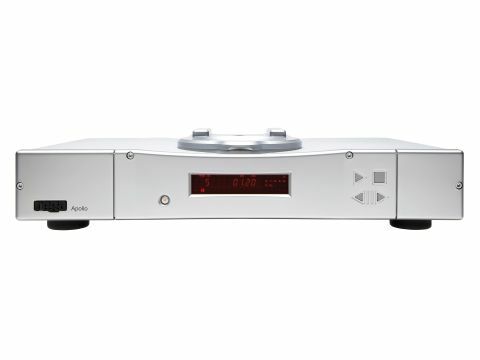 Rega's products usually stand out from the crowd visually, and this top-loading player is certainly no exception. Top loaders tend to be quicker to use once one gets accustomed to the routine. In this case, opening the lid is simplicity itself, as there is no door catch: one simply flicks up the lid and places or removes the disc. The player still takes about five seconds to recognise a disc, thanks partly to an 'initialising' routine that Rega claims is more sophisticated than the usual laser-focusing process and improves data retrieval off each individual disc. The transport itself is simple and is resiliently mounted on the thick metal top cover of the player, linked with flexible wires to the circuit board below. Most of the components on the single circuit board are surface-mount types, even including the Wolfson DAC chip. The output circuits are based on discrete transistors operating in Class A, while the power supply starts with a small toroidal transformer and features unusually small smoothing capacitors. Rega makes no mention of this in its promotional literature, but there are reasons why big capacitors are not always better. Using regular audio CDs, our panel reacted well to the Apollo's sound - indeed, it came out overall with the most praise and least blame of any player in the group. One listener who seemed to be having a rather miserable morning's listening, thanks at least in part to uncomfortably hot weather, suddenly become singularly enthusiastic, gratefully acknowledging sound with some real speed, soundstage and dynamics after what had evidently seemed a rather lacklustre session so far. The other listeners, who had probably derived more pleasure from preceding players, greatly enjoyed the sense the Apollo gave of "being there", its well judged and neatly presented levels of detail and its overall high degree of realism. Just about the only reservation expressed concerned the tonal balance, which seeme to favour the treble. Or, as one listener suggested, were some of the other players bassy? Our subsequent tests, listening carefully for that quality against some very high-flying references, suggested that the Apollo is bright, but we're far from convinced that it's enough to worry about in the long term - maybe if you already have bright amps and speakers, but scarcely otherwise. Indeed the bass is hardly lacking in impact and the precise control exerted by this player is most welcome. Meanwhile, the treble is clear, open and airy - exceptionally so at this price point - and images open up in a natural manner. It's possible to hear the little intricacies of different lines within a musical whole and at the same time to appreciate the overall effect; voices likewise are clearly differentiated yet not divorced from their environment. This is clearly a very musical piece of electronics.